OK, maybe you want to go to heaven, but you don’t want to go today…but you still want to go. Well I have some good news and some bad news. The good news is that Jesus tells us in today’s Gospel exactly what we have to do to get into heaven. The bad news is that for some of us, it seems like an almost impossible challenge. We have to love our neighbor. I’m going to let you in on a little secret. Like most people, I have two neighbors. The guy on one side is super nice. Before I got my snow blower, he used to clear my driveway with his. He’s a good guy. But the guy on the other side? I can’t stand him. He’s the neighbor nobody wants. He doesn’t take care of his property, he makes a lot of noise, and he collects derelict cars. If I have to love him to get into heaven, I may be out of luck. No, Jesus’ command is very clear, but it’s not so easy to do. The scholar then asks Jesus “Who is my neighbor?” Jesus tells him the story of the “Good Samaritan.” Notice, though, that Jesus never uses the term “good Samaritan.” He calls him a “Samaritan traveler.” This other poor traveler has been robbed, beaten, stripped of his clothing and left on the side of the road. Since Jesus is telling the story to a fellow Jew, we assume that the traveler would be Jewish, too. A priest and a Levite pass by and ignore the poor guy, but the Samaritan stops to help. Here’s the thing. Jews and Samaritans hated each other. Think Jews and Palestinians in the twenty-first century. The Jew’s own people pass him by, but the man whose people are sworn enemies of the Jews, stops and offers assistance. He puts the man up in an inn, pays the innkeeper, and even promises to pay for any additional expenses on his way back. Jesus then asks the young man who is the traveler’s neighbor and he answers, “the Samaritan.” “Good answer”, says Jesus. We usually use the phrase “good Samaritan” to apply to anyone who stops to offer help to someone in trouble. We even have what are called “good Samaritan laws” to protect people who offer help from being sued by the “helpee.” But the way we use the term doesn’t really do justice to that original Samaritan in the Gospel. He wasn’t just helping, he was helping someone he was supposed to hate. He was even risking his reputation, maybe even bodily harm, if any of his Samaritan buddies found out what he’d done. I think that’s the kind of love Jesus was talking about. The Samaritan may not have liked the man who had been robbed. In fact, he probably didn’t, even though he didn’t know him. Chances are they never saw each other again. But, by helping a stranger, the Samaritan displayed his love for his fellow human being. He didn’t have to stop. Even the Jewish priest didn’t stop. But stop he did. He helped the stranger and even though we don’t know his name, twenty centuries later we still tell his story. So, does loving my neighbor mean I have to like the guy who lives next door? No, I don’t think so. Clearly there were people, like the money changers in the temple, that Jesus didn’t like. He probably wasn’t too crazy about his fellow Jews who yelled “Crucify him! Crucify Him!” on Good Friday.. But, in His agony He asked His Father to forgive them. So, I think I can honestly say that if I saw my neighbor in trouble that I would stop to help him. I don’t wish him any harm, I just wish he lived someplace else. Maybe I’m just justifying my own human weakness by twisting Jesus’ words, but I don’t think so. Jesus did say we should love our neighbor as ourselves, and sometimes we don’t find ourselves all that lovable either. He knew that just like He knows all our faults and weaknesses. Jesus would have never set such a high bar for us that it would be impossible for us to gain eternal life. He came to save us, not to lock us out. So we continue to try our best to love our neighbor in spite of their weaknesses and our own weaknesses, too. Gustus Bozarth is a 50 year old homeless man who lives in El Paso, TX. Not long ago, he was out walking during a rain storm and saw a flag pole that was broken off by high winds laying on the ground along with the American flag. Bozarth carefully picked up the flag, shook the water out of it as best he could and carefully folded it, military style, and put it in a safe place. Then he moved the pole out of harm’s way. According to Bozarth, he never gave it a second thought. He just did it because it was the right thing to do. When the employees of the company came to work the next day they were surprised to see the neatly folded flag surrounded by the rubble left by the storm. As it turns out, the company has video surveillance cameras and were able to identify Bozarath from the video. Someone posted the video on the Internet and the story has gotten press coverage all over the world. Even though he hadn’t helped an individual human being, I think this guy qualifies as a good Samaritan. In spite of his homelessness, he loves his country. He’s a true patriot. I think loving your neighbor includes loving your country. Respecting the flag, not to mention wrangling a metal flag pole during a thunderstorm, make Bozrath a hero in my eyes, and in the eyes of thousands of other Americans. People all over the country have been offering help to a homeless man they don’t even know. There’s are two facebook pages set up in his honor, one called “Help Gustus Bozarth” and one called “Gustus Bozarth for President”, and a trust fund has been set up for him. But, he doesn’t want the notoriety or the money. He had no idea that his unselfish act would be recorded on video. He’s happy with his life just the way it is, living in back of a warehouse with his two cats. But look at what’s happened because of his simple act. By being a good Samaritan he’s caused hundreds, maybe even thousands, of people to be good Samaritans to him. Plus, his story has brought millions of dollars of free publicity to the cause of homeless Americans. He’s been seen on national television and all over the world on the web. This man isn’t a bumb. He’s just a patriotic American who prefers to live his life his own way, much like thousands of other homeless folks. Like the Samaritan in Jesus’ story, he just did what he thought he should do, and by his simple act, he’s taught all of us something about our fellow man and about ourselves. Besides securing our place in heaven, performing simple acts of charity, whether it’s helping someone by the side of the road, or simply stopping to rescue Old Glory from a storm, our little uncelebrated acts of kindness are exactly what Jesus wants from us. When the time comes to for us to stand before Jesus, I think He’ll be much more concerned with how often we acted like the good Samaritan than whether we or not we liked someone who happens to live next door. I met my new granddaughter today. Morgan Lynn Buckley drew her first breath at 11:15 this morning. 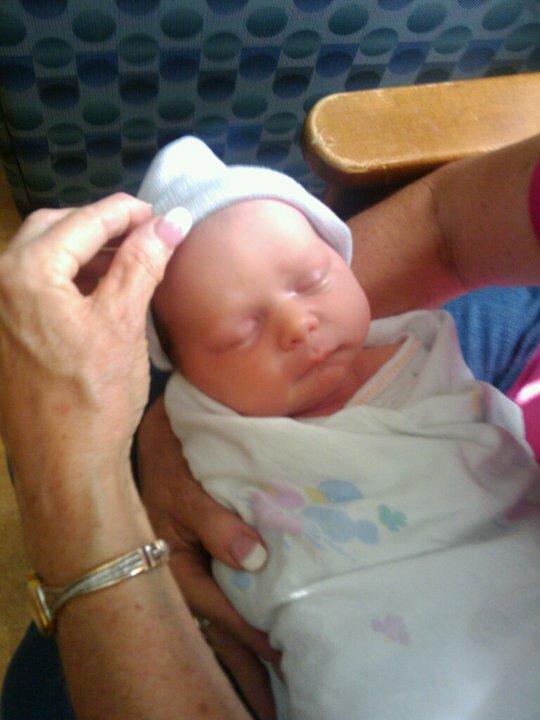 She was almost two weeks ahead of schedule but still weighed more then seven pounds. She is, without a doubt, the cutest baby ever! As I laid my hand on her chest and felt her tiny lungs pumping the first of many millions of breaths in and out of her small body, I couldn’t help but wonder what the future holds for her. This is such an uncertain world. Even though I know that God will hold her in the palm of His hand, we live in precarious times. Economies are failing, countries (including our own) states and cities are out of money. There is an element at work in the world that would like to see our country go down in flames. Sadly, I’m afraid our enemies are more interested in our future than many of our own citizens. That’s not a good situation. But my vocation is to preach hope and I take it seriously. God will provide for the faithful ones and that’s what keeps many of us going. I can’t quite understand how people without faith get out of bed every morning. So I’m full of hope for all my grandchildren including little Morgan who’s only hours old and our unborn grandchild due in Mid-August. I hope you’ll forgive me for worrying just a little bit. Isn’t that what grandfathers are for?